made from fine-grained porcellaneous white clay covered with a transparent glaze, with a sculptural handle modelled as a stretching lion shown standing on the shoulder of the ovoid vessel, grasping the inner rim of the flaring trumpet-shaped neck with its forepaws and peering inside, with freely modelled and incised details delineating the lion's head and applied with a spiky mane and a tufted tail, the short tubular spout rising from the opposite shoulder, modelled as a dragon's head with a pointed snout and a single curling horn, the base of the spout decorated with a raised collar of ribbing at the join, the unglazed circular base cut flat and smooth, with neatly chamfered edge. 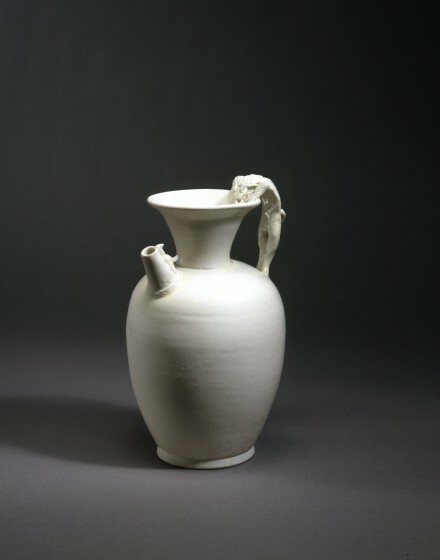 Compare the very similarly modelled white ewer of smaller size with a copper mount on the cut down neck in the Freer Gallery of Art, Washington D.C., illustrated in their compendium of selected masterpieces, The Freer Gallery of Art, I, China, Tokyo, 1972, no. 87. Another similar ewer, also of smaller size, is illustrated by d'Argencé in The Hans Popper Collection of Oriental Art, Tokyo, 1973, no. 71, p.112, together with a miniature example. Other miniature examples are illustrated by Gyllensvard in Chinese Ceramics in the Carl Kempe Collection, Stockholm, 1964, p. 100, nos. 287-289; by Krahl in Chinese Ceramics from the Meiyingtang Collection, London, 1994, Vol. I, no. 204, p. 124; and another from the Avery Brundage Collection in the Asian Art Museum of San Francisco is illustrated by He in Chinese Ceramics: The New Standard Guide, London, 1996, no. 141.